Then I set off to analyze the two definitions for overlap and differences. So, I decided to go to create a Word Cloud on Tagxedo.com based on the text in bold. Looking at the word count analysis, between the two phrases, the only overlap was the word, “evaluate.” And upon closer inspection of the terms used, though there are some differences in the nuance of the words, many of the terms used are related: “find/access,” “interpret/analyze,” and “use and create/communicate.” So, that didn’t seem to clarify much for me. 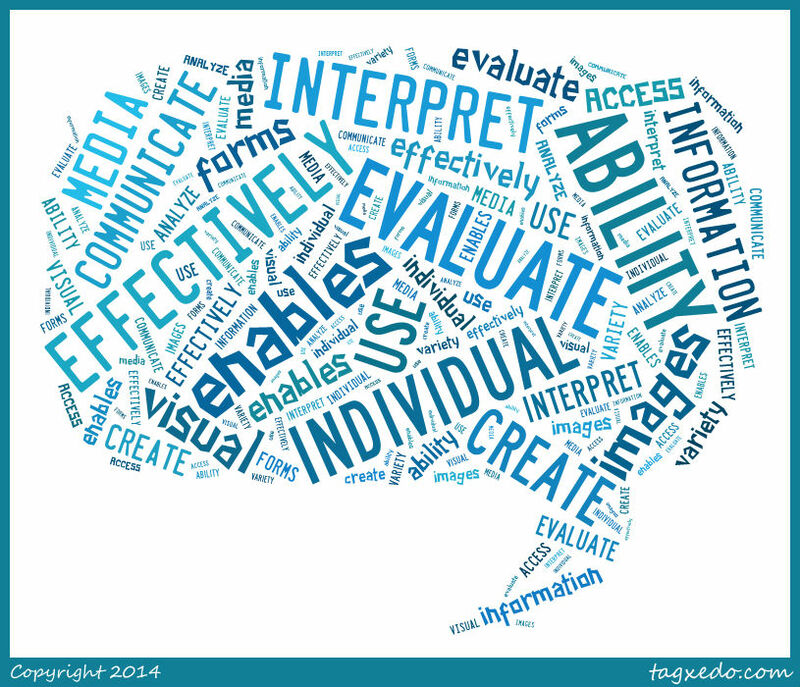 Visual Literacy is the ability to access, analyze, evaluate and communicate ideas and thoughts visually. Media Literacy is the ability to access analyze, evaluate and communicate ideas and thoughts through various forms of media including and not limited to things that are visual (ex. audio). *There was supposed to be more in this one post, but I didn’t think it would show how I’m starting to think about my blog posts, so “Visual, Media, Literacy: Wha?” became 2 posts. Thank you for enduring the mess of my mind. Thanks for taking the time to clarify the differences between visual and media literacy. I’ve seen the terms in various posts and articles and it’s helpful to understand exactly what is meant by each. Good call on the creation of separate posts. The deliberate break between the two gives both ideas equal floor time and provides greater clarity for your reader. They are also a pleasure to read in this format.